Suffolk County Community College Professor of Physical Sciences Scott Mandia, of Miller Place, recently met with U.S. Representative Lee Zeldi in Washington, D.C. as part of the 2016 Climate Science Day on The Hill. 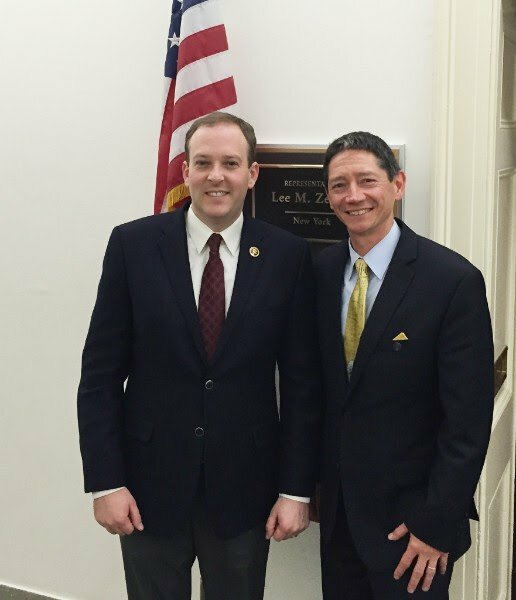 Washington DC - February 17th, 2016 - Suffolk County Community College Professor of Physical Sciences Scott Mandia, of Miller Place, recently met with U.S. Representative Lee Zeldin, at left, in Washington, D.C. as part of the 2016 Climate Science Day on The Hill. Mandia also met with US Senator Charles Schumer and four other representatives. Mandia, representing the American Geophysical Union, was the only community college representative in attendance from a dozen scientific groups addressing legislators and advocating for climate change legislation. Subject: LongIsland.com - Your Name sent you Article details of "Suffolk's Mandia on The Hill to Speak About Climate Change"